South American sapote is a native of Upper Amazon. It is widely distributed in the tropical zones of the South America under rainy climates. 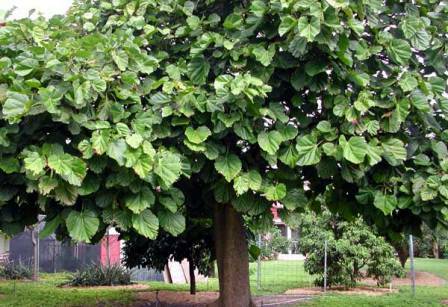 This fruit is planted in gardens and is fondly eaten by local people. It also sold in the markets, but still it is restricted only to South America and is barely known in other parts of the world. A fast growing, erect semi-deciduous tree to upto 50 m high. Leaves alternate, long petioled, clustered in ; and copious gummy yellow latex. The semi-deciduous, alternate, long-petioled leaves, clustered in rosettes near the ends of the branches, broadly heart-shaped, normally15-30 cm long and nearly as wide. Flowers are short-stalked, yellowish-white or rose-tinted, 5-petalled, about 2.5 cm wide, with 5 conspicuous, protruding stamens and pistil, borne in masses along the lesser branches and on the trunk. 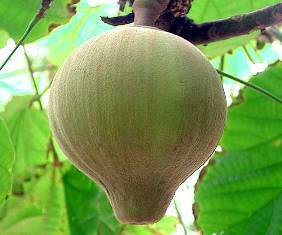 Fruit is rounded, ovoid or elliptic with a prominent, rounded knob at the apex and is capped with a 2- to 5-lobed, velvety, leathery, strongly persistent calyx at the base; 10-15 cm long and 8 cm wide, weight 800; rind is thick, leathery, greenish-brown, and downy. 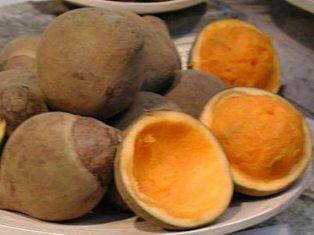 The flesh is orange-yellow, soft, juicy, sweet and of agreeable flavor surrounds 2 to 5 seeds which are 4 cm 2.5 cm wide, long fibers extend from seed through the flesh. Fruits are eaten fresh. These are highly esteemed in some areas. The fruits are also added to desserts. Sometimes the fruits are also processed into juice and nectar. !00 g dibble portion of South American sapote fruit contains, moisture 85.3 g; protein, 0.129 g; fat, 0.10 g; fibre, 0.5 g, ash, 0.38 g, calcium 18.4 mg, phosphorus, 28.5 mg; iron, 0.44 mg; thiamine, 0.031 mg; riboflavin, 0.023 mg; niacin, 0.33 mg; ascorbic acid, 9.7 mg.
Wood is used for construction, furniture, and fire.